Supporting my comic on Patreon helps pay the bills and helps you see the comic early, in color, see extra cool giraffe drawings (I’m running a series of giraffe drawings right now I like to call The Giralphabet), and more! I had a lot of fun figuring out this strip. I had been watching a lot of Youtube video essays about what went wrong with the Hobbit Trilogy which got me thinking of the better trilogy of Lord of the Rings and all the cool parts, funny parts, and quotable moments. “YOU SHALL NOT PASS!” is iconic and everyone knows it, and everyone has used it in silly jokes about paying with checks or crossing the street, Gandalf as a teacher… I had to find something else, that well has run dry. Food is always something on my mind and a great moment early on in Fellowship is the Second Breakfast scene. Food is great, and with these new diets out right now about eating all sorts of stuff I thought it would be a fun book to see published. 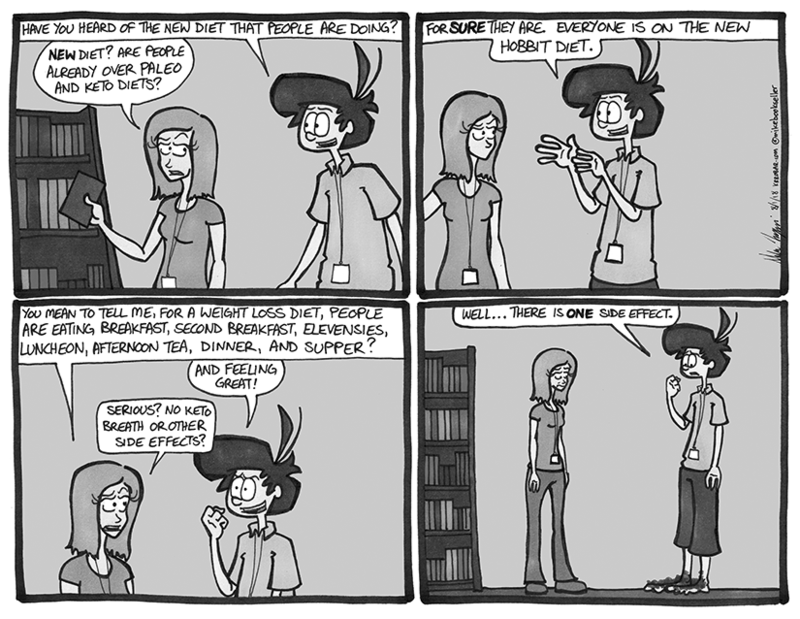 I would totally buy The Hobbit Diet and run my food choices accordingly. I welcome the hairy feet.